Mummy-Tips: Are you a mum looking to boost your income? Are you a mum looking to boost your income? Sometimes it's essential for women to return to the working environment after they have children; weather they want to or not and especially in the current economic climate. According to research, 78% of married couples both need to work simply so that they can provide for their family and enjoy the lifestyle that they desire. However, due to hectic lifestyles and heavy workloads, a full time position outside of the home just isn't appealing. Luckily there has been a recent boom in franchise opportunities that allow flexible home based working, to a schedule that fits into your lifestyle. An increasing number of franchises are directly targeting new and existing mums who are looking to create that 'perfect' life / work balance. There are some great franchise business opportunities out there that allow you to reach your goals whilst spending time with your family. 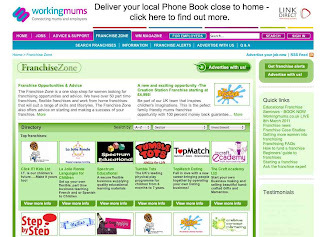 Visit www.workingmums.co.uk today for help and support for mums weather you are working full-time, part-time or from home. Do any of you guys run a franchise? What do you think are the pros and cons? I am a Scentsy consultant in the US. The company is migrating over to the UK and Germany this spring! I love it because I have as much freedom as I want...and I get to stay home with Sam [he's 3 months old].